You are at:Home»News»Industry News»Crystal Cabin Awards 2018: the winners! Crystal Cabin Awards 2018: the winners! The 12th year of the Crystal Cabin Awards is perhaps the most successful yet, with 91 innovations submitted from 18 nations. A jury of international experts evaluated and deliberated those submissions to create a shortlist of 24 finalists across eight categories. The competition was tough, so while the winners are highly deserving, the runners up are also highly impressive. 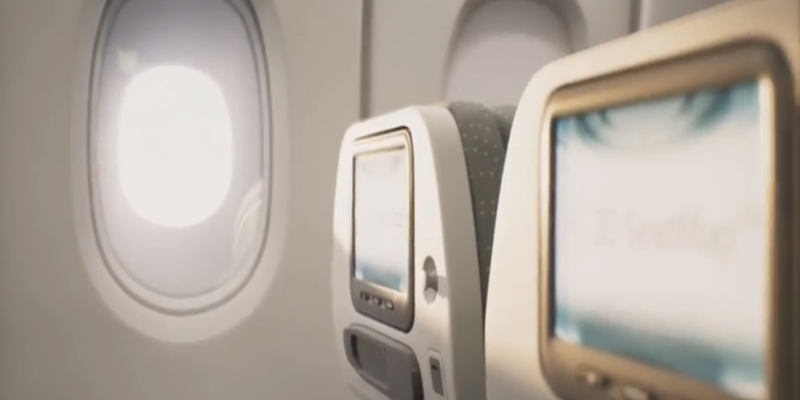 The IFEC (in-flight entertainment & connectivity) category is new for the 2018 awards, and includes systems, antennas, passenger apps, moving maps, wi-fi features, and more. The winner is Bluebox Aviation Systems, with its ‘Accessible IFE’ platform which gives visually impaired passengers barrier-free access to IFE. The good news for potential users is that the platform is already flying with Virgin Atlantic. For insight into US regulations and advances in closed captioning, see our two-part series by expert Michael Childers. Runners up: Inmarsat’s European Aviation Network, which sees more than 300 Deutsche Telekom ground stations provide passengers with LTE connectivity network access throughout Europe this year, and an entertainment concept from United Screens for the first onboard 3D television – the key being that it does not require users to wear special glasses. This popular category is usually of the most consumer interest, with airlines going head to head with their latest product: for example, last year United’s Polaris took on the Delta One suite in a business class battle, with Delta One taking victory. 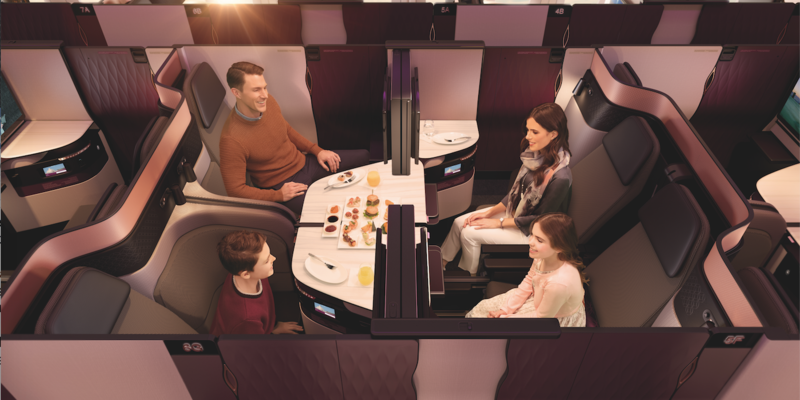 This year design consultancy PriestmanGoode and its client Qatar Airways won with the unique Qsuite business class. Four seats are arranged together in this innovative design, which can be kept separate, or with the simple slide of panels, two, three or all four of the suites can be converted into an open area for a family or other traveling group to dine together, and double beds can be deployed. Runners up: Also vying for the trophy were Singapore Airlines with its new A380 First Class suites featuring a swivel chair that enables a view out of the window while dining, and a partition between neighboring suites that can be stowed away to create a double bed. Airbus was also competing with its Airspace cabin for the A320 family, with a focus on improving the flight experience for all passengers through features such as extra-large overhead lockers, light and airy panels and atmospheric lighting scenarios. This category comprises new products that bring benefits to airlines, such as seats, galleys, lavatories, trolleys, air conditioning, electrical systems, electronic cabin management systems, waste and potable water systems, acoustics, etc. Evaluation criteria includes efficiency of mechanical solutions, ergonomic advantages and ease of implementation. This year saw a head-to-head between two giants of the aircraft interiors industry: Rockwell Collins and Zodiac Aerospace. 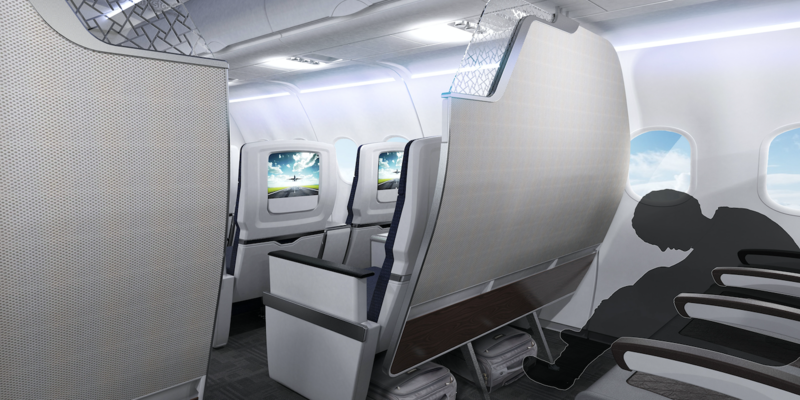 Rockwell Collins won with Silhouette MOVE, a flexible partition between business and economy class that is curved in such a way that the passengers sitting in front can recline further, while those behind stretch their legs and stow carry-on baggage. Runners up: Zodiac Aerospace’s Durinal is a urinal unit that can reduce queues in the aisles, as well as cabin weight and complexity. 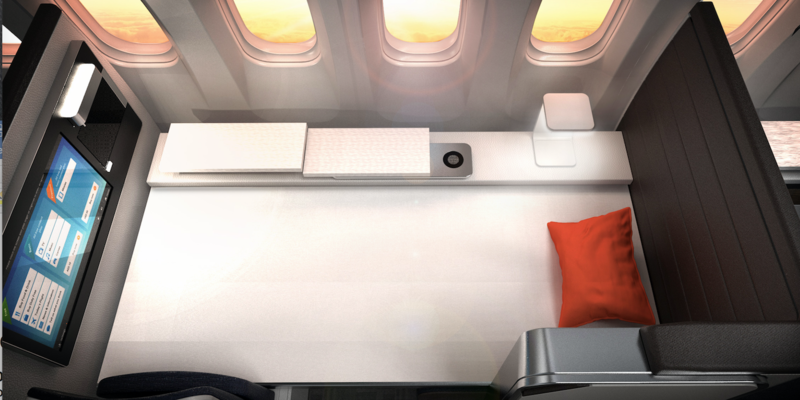 With a view to improving comfort on short-haul routes, the PASSME Consortium had a strong contender with the PASSME Innovative Aircraft Seat, which enables the seats of an economy row to be pushed together during boarding, creating more space in the aisle to reduce congestion and speed-up boarding. This category combines different classes of innovations. An entry for this category must either reduce negative effects on the environment, or it must minimize health or safety hazards and security problems for passengers, staff or live cargo. 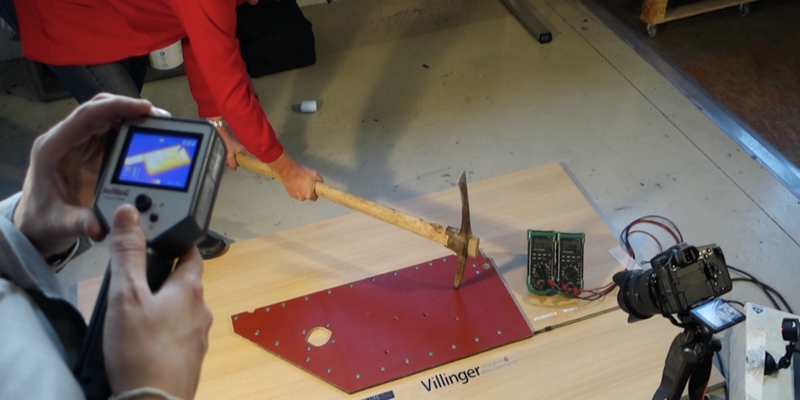 Villinger took the prize with LiteHeat, a heated floor panel. While most foil or cable-wrapped heated floor elements can be extremely sensitive, this Austrian innovation is claimed to be indestructible, reducing maintenance requirements and enhancing passenger comfort. Runners up: Boeing’s ‘Cabin Dry Floor’ lavatory flooring system drains away moisture, leaving a dry, germ-free surface, while VT Miltope’s security software for wireless cabin networks also impressed the jury. Developing new materials, new material applications or a new combination of materials for cabin systems can cut production costs and maximize usability. This category embraces an enormous variety of different aircraft components. Entries can be an innovative, single technical component, or material, but not a fully developed product like a seat. Airbus and Altran won this category with a printed electrics process, a digital technology using conductive inks to print routes for data and power transmission on a flexible foil, replacing cable harnesses. The technology reduces parts count, weight and manufacturing costs, and simplifies the electrical architecture, while also enabling quick customization. 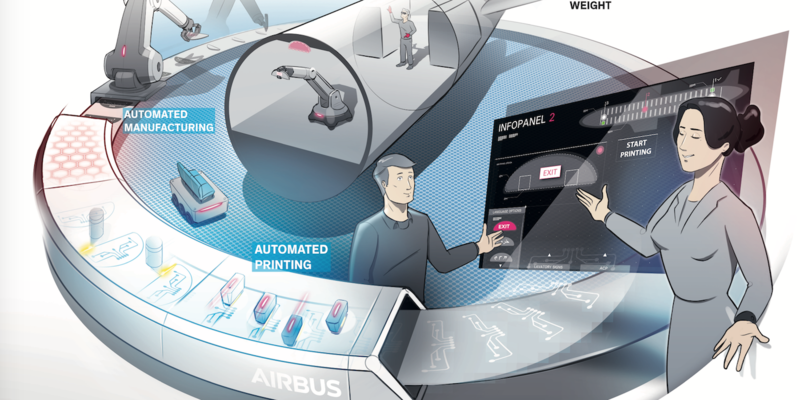 A joint Airbus and Altran project team developed a demonstrator for a first use case on an A320, with a printed information panel that displays safety and comfort information. In the future, printed electrics technology could be used in air conditioning, data transmission and lighting systems. Runners up: Rockwell Collins was a finalist, with its Secant Luminous Panel, which lights up the cabin ceiling with high-resolution images. Weigele Aerospace was also in contention with its Airborne Cooking Robot, an energy-saving oven for the galley that allows cold and warm food to be prepared on one plate at the same time. This category was created in recognition of the importance of passenger comfort, and all entries must improve comfort within the cabin, either for all passengers or for specific groups of passengers. Entries in this category can include economy seats, lavatories, bins, partitions, lighting system, linings, premium, business, first class products, VIP products, etc. An innovation that is of general use to a large group of individuals may well achieve higher marks due to its increased effectiveness for the airline´s success. Rockwell Collins took home the award for its Valkyrie Bed, a super-business design with a separate seat and bed. The secret to this space-efficient design is a roll-up mattress that can be drawn across the seat from the wall panel when needed. Runners up: Zodiac Aerospace’s Eco Zlounge concept enables economy passengers to create extra leg space from an empty seat in front, and airlines to create extra revenue. Meanwhile LIFT by EnCore, in collaboration with Boeing, made the finals with a comfortable approach to long-haul seating for the Dreamliner. 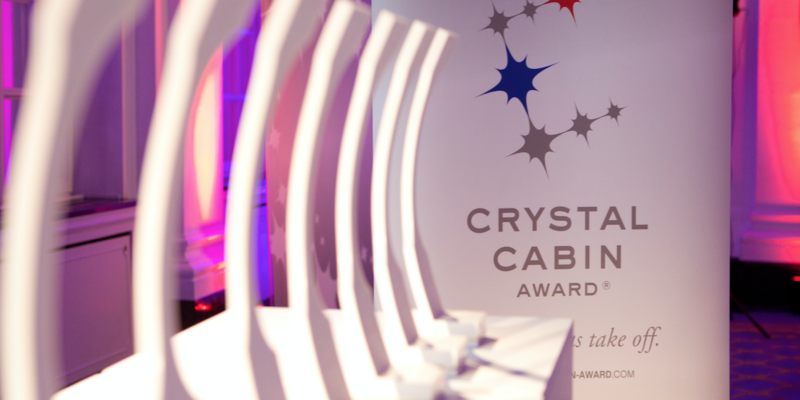 The Crystal Cabin Award isn’t just about the big names in the aviation industry. This category provides an opportunity for students to present their visions for innovative products and concepts for the aircraft interior. Their ideas should reflect the idea of making flying more comfortable or ecological. Cranfield University in the UK made it into the final with ‘E-tom Smart’, a water tap that atomizes water to achieve onboard water savings of up to 90% without reducing its effectiveness for washing passengers’ hands. Runners up: The University of Edinburgh made it to the final round with its pioneering li-fi technology, which uses visible light to transmit data, much like wi-fi. Over in the USA, students at the University of Cincinnati, together with Boeing, competed with a holographic surface that turns the aircraft cabin into a virtual extended space. Here we can see impressions of the aircraft cabins of tomorrow. 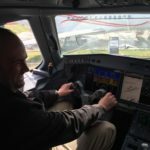 How can comfort be maintained in future air transport when current technologies and practices (especially carbon-based fuel) become more and more limited? How can passenger comfort and aircraft efficiency be improved? Spanish company Renacen won with its ‘3D Seat Map VR software, an application which offers a virtual 360° view of the cabin from the passenger perspective during the flight booking process. Runners up: The ‘Day and Night’ concept from Airbus divides premium cabins into a living/working zone and a separate sleeping zone, while Rockwell Collins’ ‘Universal Passenger Seat Interface’ concept is an electronic system for seating that can be deployed everywhere from aircraft to private cars, creating synergies throughout the transport sector.